Creating a Demand Planning System Worthy of the Digital Supply Chain - E2open | Demand. Supply. Delivered. History is a poor predictor of future sales in today’s fast-moving world. However, many companies still rely on traditional demand planning systems that employ time-series analysis to create forecasts. Increased dependence on new products and promotions to drive growth further compounds the problem; new items lack the two years of data required for time-series analysis and promotions are by nature designed to ensure that history does not repeat itself. There are, however, some bright spots with leading companies using new demand sensing technology capable of capturing and analyzing the abundance of real-time data in the digital supply chain. 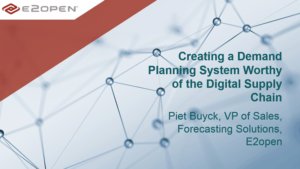 In this webinar, Piet Buyck, VP of Sales, Forecasting Solutions at E2open, explores this new technology, barriers to change, and how it will affect the future supply chain.